Review by AllTheBestFights.com: 2016-11-05, fight not particularly exciting between Ricardo Lamas and Charles Oliveira: it gets two stars (UFC Performance of the Night). Both fighters are black belt in Brazilian jiu-jitsu, Ricardo Lamas entered this fight with a record of 16-5-0 (50% finishing rate) and he is ranked as the No.6 featherweight in the world while his opponent, Charles Oliveira, has a mma record of 21-6-0 (90% finishing rate) and he entered as the No.7 in the same weight class (currently the #1 in this division is Conor McGregor). Both Lamas and Oliveira have lost their last bout: Ricardo was defeated by Max Holloway (=Holloway vs Lamas) while Charles ‘do Bronx’ lost to Anthony Pettis (=Pettis vs Oliveira). 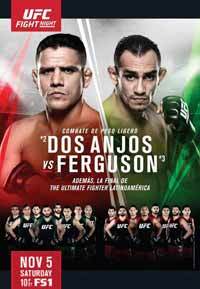 Lamas vs Oliveira is on the undercard of Rafael dos Anjos vs Tony Ferguson – UFC Fight Night 98 – Tuf Latin America 3 Finale. Watch the video and rate this fight!